Behind the Italian winner Marta Bastianelli, Vita Heine finished 18th in the Tour of Flanders. 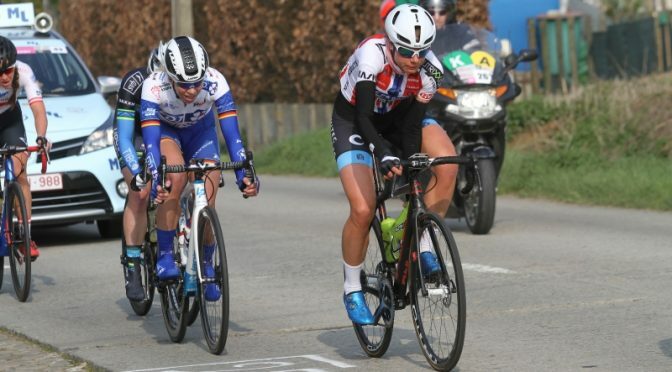 The Norwegian champion of Team Hitec Products – Birk Sport rode a good race and showed herself in front. Earlier in the race, Chanella Stougje was involved in a seven riders strong lead group that got a maximum advantage of 3.40 minutes on the peloton. Stougje was in the early attack, together with six rider from all different teams. They escaped when the 159 kilometers long race was only six kilometers on the way. With 46 kilometers to go, after being in front for more than 100 kilometers in front, the front group was caught.